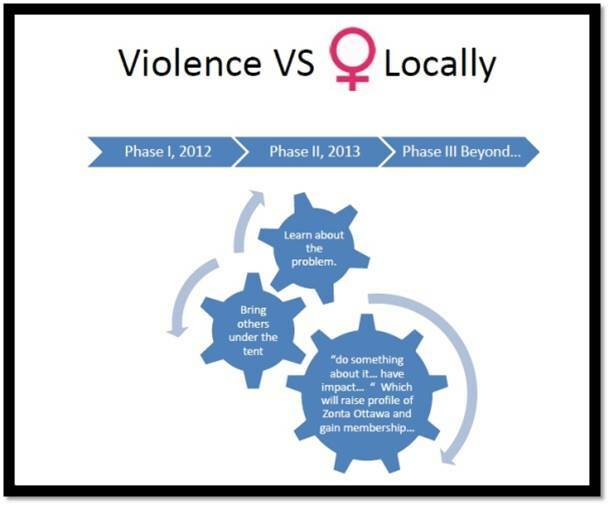 The Zonta Ottawa members held a strategic planning session and agreed to focus our program for 2013-2014 on violence against women locally. This focus is in keeping with the Zonta International program “Strategies to End Violence Against Women” which has as one of its goals “encourage Zonta club’s involvement in local and national advocacy initiatives and service projects.” The 2012 – 2014 Zonta International initiatives to end violence against women are described in the July 2012 issue of The Zontian. Phase I – Learn about the problem. Phase II – Bring others under the tent – thus our small membership can join with others to have a greater impact. Phase 1 and Phase II of Zonta Ottawa programs was focused on learning about the problem and bringing others under the tent. To facilitate this we contacted the Ottawa Coalition to End Violence Against Women (OCTEVAW). OCTEVAW is a coalition of over 40 local organizations dedicated to ending violence against women and to providing a coordinated response to women and their children who have experienced abuse. In October, we held our second meeting – with a focus on learning about Elder Abuse. Guest speaker, Kaelen Bray provided an overview of this important topic. Kaelen graduated from Queen’s occupational therapy program (BSc.OT) in 1998 and received her Masters – Post Professional OT from Dalhousie in 2011. She is currently working for Carefor Health Community Services providing occupational therapy services to individuals (primarily in elderly and their families) at home. In March, 2013 our speaker was Manon Thompson from the Champlain Elder Abuse Response Coalition. Manon provided an excellent overview of services available in the Ottawa region. The Club struck a committee to further activities including: Carmeli Toguyeni, Sylvie Begin, Mona Tobgi, Sophia Papahariss Wright, Margaret Mitchell, and Susan Smith. 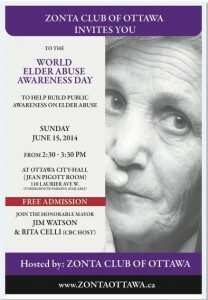 On Sunday, June 15th, 2014 Zonta hosted the first Ottawa World Elder Abuse Awareness Day at Ottawa City Hall. the Honourable Mayor Jim Watson was on hand to express the importance of the day and Rita Celli, host of Ontario Today was the Master of Ceremony. Over 100 attendees, Zontians, community members and their families were on hand to help build awareness of Elder Abuse in our Ottawa. Our appreciation to Sylvie Begin who spoke on our behalf for Entre Nous, TV Program.